Log in or Register FOR FREE to start tracking credits! Track. Store. Update Your Continuing Professional Education in One Place. "cpetracker.net has saved me tons of time and energy trying to remember what credits I have and what I need." "My Whole Firm uses this site and we like it because we can login from anywhere to update and check our credit requirements." 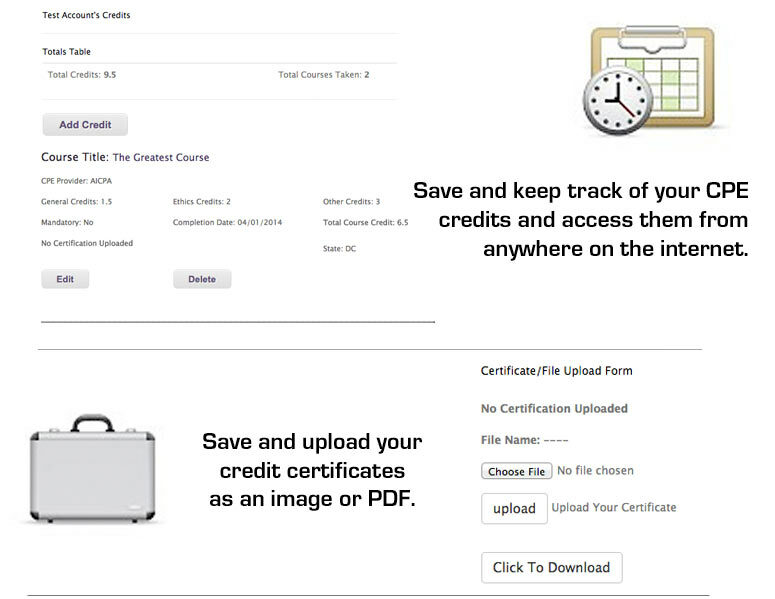 With our online continuing professional education credit tracking website, you can keep track of all of you CPE courses in one place for free. Sign up for our email list and we will occasionally send you continuing professional education deals, offers, or important news. Keeping track of your CPE credits is easy with our tool to help you do it. Log in on your iPad on laptop at a meeting or a course and upload your certificates right from your seat. We are adding new features all of the time, so sign up to the mailing list to recieve the announcement emails of new features. Learn more about our CPE tracker features and how it can benefit your firm, we are always updating the features.